We care about continuity because the past is important. In the real world, we don't really have to worry about whether or not our birthday changes from year to year, or if that guy who sits three desks down used to be taller, and a different shade of purple. Those things are taken care of for us. (And how frightening would it be to have that suddenly unwind? To wake up one morning and realize your room is half a foot smaller in area than it was the night before, and your toothbrush is a different color, and your shoes don't fit. Everybody has moments when they wish the world would change to fit their needs better, but maybe the real reason it doesn't, outside all that physics and math I can never get straight, is because the alternative is just too awful. It's all right if I occasional forget the day of the week, as long as the rest of the world remembers.) In fictional universes, though, the more invested I become in a story, the more important it is that the story holds together. When it doesn't, it nags at me. I've read Stephen King's The Drawing Of The Three half a dozen times now, and each time I read it, I notice bits that contradict other bits, and while I realize that sort of thing is inevitable, and it's probably my own damn fault for being so obsessive, it still nags at me. I need events to add up properly into a coherent past, so that I can still care what happens when I turn the next page. Even when I already know what comes next. I mention this because I had two reactions to the end of "Lethal Inspection," and the second reaction was, "Wait, doesn't that contradict an earlier episode?" I know we've seen Bender's "birth" before, and I remember him coming out of Mom's factory fully-formed. Plus, really, robots don't grow. That doesn't make any sense! I should sue somebody. That didn't really matter, though, because my first reaction was the important one, and that first reaction wasn't really a put-into-words moment. Futurama does great nerd jokes, and it's often very clever and sharp and biting, but what really put it on the map for a lot of fans (myself included) was its willingness to bring out place moments of pure, unabashed sentiment in the middle of all that cynicism. Sometimes those moments are heartbreaking (right after "Lethal," Comedy Central showed "Time Keeps On Slipping," and while it's no "Jurassic Bark," that ending is still pretty damn harsh), but sometimes they aren't, and tonight's episode was on the positive. If I had to name a character on the show least likely to pluck at my heartstrings, Bender and Hermes would be near the top of the list (I can't really imagine Mom suddenly showing depth, though), and yet they pulled it off. 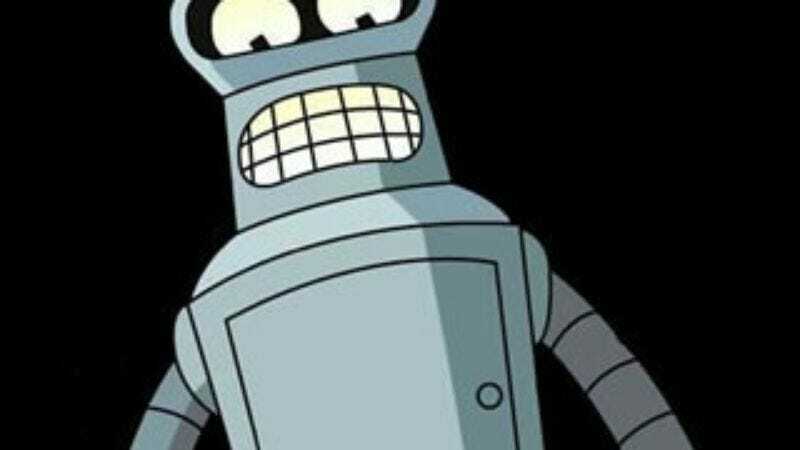 I'm not sure if Baby Bender violates continuity or not, but I don't care. It worked. The other reason I mention continuity is that "Lethal" is all about Bender discovering he can die, and our past—and how it connects together—suddenly becomes a lot more important when you realize you don't have as much of a future as you thought. (Poor Bender. He only has "between a minute and a billion years" left.) So Bender, realizing that he doesn't have any body to download into in the case of an sudden rush of mortality, decides to find the one person who should've caught this error early on and dealt with it: the mysterious Inspector #5. It turns out it's Hermes. Spoiler there, I guess. Bender must be a lot of fun to write. He can be heartfelt, larcenous, and misanthropic without ever becoming self-contradictory, and he tends to just grab on to what ever is in front of him and go with it. So tonight fell into the range of moderate character development. In "Proposition Infinity," his sudden commitment to legitimizing robosexual marriage (and yes, I typed that with a straight face) made sense because Bender's gotten crazy about causes before, especially when that cause allows him to talk about his favorite thing in the world: himself. "Lethal" is a bit more thoughtful. This is probably as sincere as the character ever gets, still motivated by self-interest (the purest form of self-interest: not wanting to die), but without any pretense that he's striving for something greater than himself. 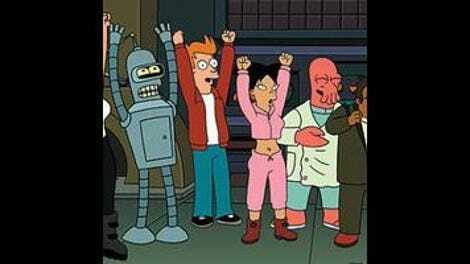 That we managed to get an ending as undeniable sweet as the one we got without needing to compromise Bender in any way is just one of the things I love about Futurama. And hey, more face time for Hermes! I wouldn't have thought a team-up between him and Bender would've been this profitable, but it yielded some excellent dividends. (This will, hopefully, be my only finance-related pun in the review.) The show gets a lot of mileage out of being consistent with its core characters, and that consistency was strong pretty much from the beginning. Hermes can be an obsessive, number-loving accountant, and still have that memory of his younger self saving Baby Bender from the trash heap. It works because the twist is the discovery of compassion in someone we liked and wanted to love. Usually at this point in a series' run, the leads' traits and interests will have turned into tics and obsessions through simple repetition, but since we started from a point where we had to either accept everyone in this world is crazy, or give up completely, there's a freedom to deepen in the other direction. As for the jokes, well, hit or miss as always. The various "Darths" seemed a little on the nose, but once the story got going, the gags improved accordingly. I would've quite liked this episode, without that final beat, but that beat killed, continuity breaking or no. (And seriously, if I'm wrong on it breaking continuity, let me know.) (Because I really have to ask you to correct me, right?) I had to work late tonight, but it's not so bad when I get to end on this note. I can wake up tomorrow in the right bed, in the right room, knowing that Futurama is still, bumps and all, a damn good show. That dead bear joke was genius. The only false note in the episode for me was the Hollywood Squares gag at Hermes' office. I was fine with the first part, but having the red X light up at the end seemed too obvious. Either you were going to get the reference or you weren't—I can't imagine spelling it out was going to help anyone who didn't grow up watching the game show. Oh, and Leela makes a terrible bureaucrat. Who knew? "This is every bit as fun as the real Civil War!" "Until now, I thought giant cubes were exciting." "I did like the part where they screamed." "That's a calculator. I ate it to gain its power." "Suicide is not necessarily the answer!" "In fact, I'm putting you on the Do Not Kill list!"